It’s Lester’s lucky day! Winning the lottery show Lucky Day, Lester is about to win $2.2 million. But that’s not why Two-Face is here. Lester’s last name is Dent…and he’s Harvey’s father! He didn’t come to steal the money but to expose his father for the drunken abusive gambling addict that made him what he is and either kill him or make sure he doesn’t get that money. That double-cross doesn’t sit well with his goons, as Batman and Batgirl stop Two-Face. There’s still some money left and Lester wants to use his luck in Atlantic City because it’s his lucky day. Too bad the money is evidence. Harvey Dent still wins. What they got right: Of course issue #2 has Two-Face, but it’s the right story. 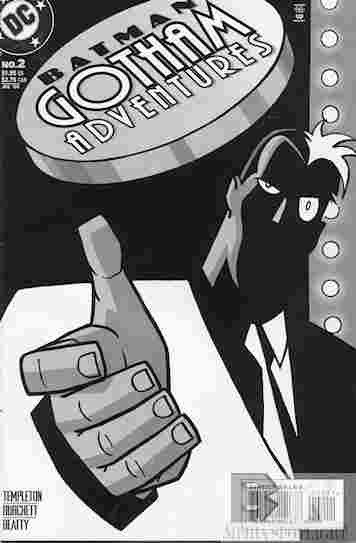 We have the origin of both Two-Face’s lucky coin, and Harvey’s “Big Bad Harv” persona that was part of him becoming Two-Face, as mentioned in his debut episode as his fractured alter-ego. This is personal for Harvey, so that even the coin flip isn’t necessary to ruin Lester’s day, and if not for Batman and Batgirl it would have been the end of his life, too. What they got wrong: Not making this into an episode. It’s a really good look into what made Harvey Dent, “Big Bad Harv”, and ultimately Two-Face. Recommendation: I don’t know if this backstory is canon or not but it should be, at least the DCAU version of Harvey Dent. That makes it a must-own issue. Posted by ShadowWing Tronix on October 7, 2017 in Animation Spotlight, DC Spotlight, Television Spotlight, Yesterday's Comics and tagged Batgirl, Batman, DC animated universe, DC Comics, DCAU, Two-Face.